Foot diagnoses is provided, to examine any issues that may require possible medical opinion or other recommendations as in seeing another health care provider . Medi Pedi is a more involved pedicure, focus on healthy feet, and healthy nails. A 45 to 60 minute service to provide a foot soak, as well as removal of dry or callused skin, cleaning up your foot from tip to toe. Focusing on cracked heels, peeling between toes, athletes foot, nail fungus, thick calluses, all with consideration that we base our pressure and products leaning towards diabetic foot care (this is important as the general public may be unaware that they may have diabetic foot issues. Gently exfoliating your rough skin away, providing a healthy glow back in your toes. Calf and foot massage included with this service. You may request reflexology to be added into this (even the warm up is amazing part to add in)1/2 session is additional $20, full session is additional $45. 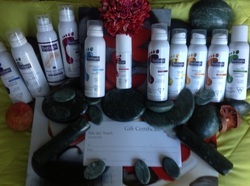 FOOTLOGIX products are also used for medi pedicures. Footlogix's unique groundbreaking Dermal Infusion Technology enables active ingredients to penetrate faster and deeper into troubled skin of the feet. With results seen in a mere few days, from curing simple dryness to addressing more server conditions resulting from Diabetes, Footlogix has been clinically proven to perform. Developed by Katharin von Gavel, one of North America's leading authorities and true pioneers in Pedi-Care. Anti -Fungal Formulas (3)- Peeling skin formula/ Rough skin formula/ Anti fungal toe tincture spray. can be used between the toes for peeling skin. Tincture contains avocado oil, & panthenol to restore a healthy sheen to the toe nails. Rough Skin Formula- Contains effective anti microbial agent & moisturizer which provides effective relief from itching-scaling-irritation of the dry skin prone to fungal infection (athletes foot). Peeling Skin Formula- Contains an effective anti microbial agent to provide relief of peeling skin on the soles & itching between the toes resulting from athletes foot or fungal infections. Cracked Heel Formula-& This formula is proven to moisturize & heal extremely, callused, thick,cracked skin. Daily Maintenance Formula- For normal to dry skin proven effective as daily moisturizing product to maintain healthy feet. Very Dry Skin Formula- this is proven to moisturize and restore foot care for all Diabetics. DD Formula- Double Defense-lightweight creamy mousse locks moisture into the skin with each application, The Spiraleen anti-microbial properties make this formula a great product for all around coverage and care. Specialty Formulas (5) -Cold feet formula/ Sweaty feet formula/ Tired feet formula/Foot deodorant spray/ Shoe deodorant spray. At Home products (3)- Foot soak/ Exfoliating scrub/ Massage formula. FOOTLOGIX products are also used for mini pedicures.